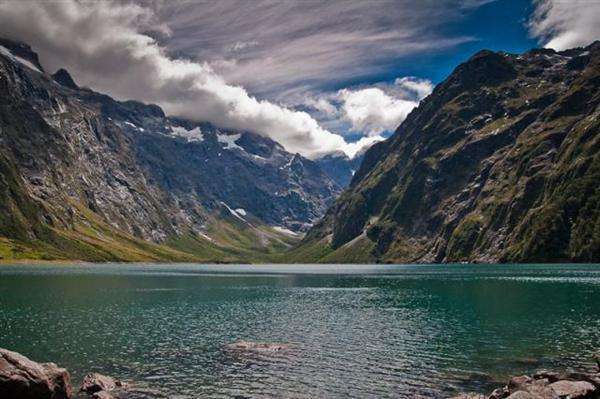 Probably the nature is main thing attracts people to New Zealand. Though a lot of tourists come to New Zealand only for couple weeks and it is far from enough to hike (or tramp) longer treks like Milford track which takes about 4 days to complete. But time shortage should not stop you to do at least shorter hikes. One of such short hikes is Lake Marian trail in Fiordland National Park (somebody calls it Marion lake, but it is probably just misspelling). Track is located on the way to famous Milford Sound. It is not easiest walk as track is steep in some places and can be muddy after rain, but it takes less then an hour to reach the lake and you’ll be rewarded with view to beautiful alpine lake surrounded by mountains. Water even in summer is quite cold but is very refreshing if you’ll be keen to swim in hot day. Here are more pictures from Fiordland in New Zealand and information about other short walks in South Island, New Zealand. That place looks great! I’m heading to NZ next year, so will note this down. We go here sometimes on our Secret South Safari. It is a magical little spot. Sorry Anne, I revealed your secret 🙂 I wanted to share it as I saw so many buses and cars on the way to Milford Sound passing by without stopping there. Love the post. Hope hiking shoes should guide someone there. Didn’t see anybody fishing, so I can’t tell you are there any fish.